The Preliminary Counts of the 2010 Population Census of October 1, were released on February 25, 2011. The Population Census is the most important statistical survey for clarifying the actual state of Japan's population and households. It has been conducted every five years since 1920, and the 19th Survey was conducted in October 2010. The results show that the total population of Japan as of October 1, 2010 was 128.056 million. 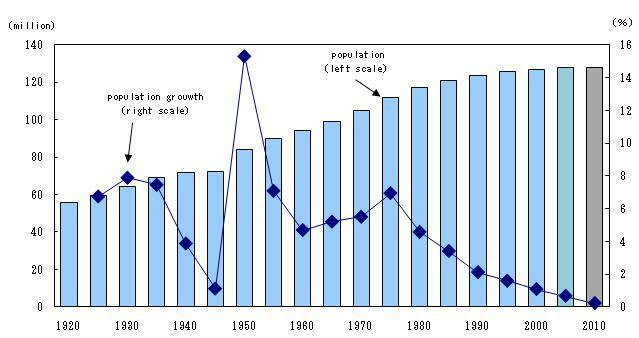 During the 2005-2010 period, the population of Japan remained nearly stable (increase of 0.2% in five years, or 0.05% per annual), which is the lowest since the Population Census was begun in 1920. According to the United Nations projections, the World Population (Medium Variant) in 2010 was 6.909 billion. 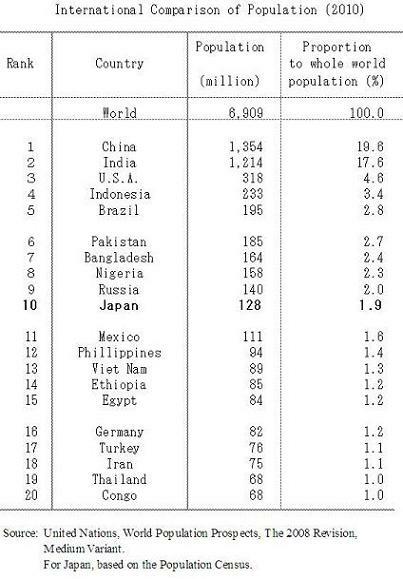 Japan's population based on the most recent census results ranks tenth in population, following China (1.354 billion), India (1.214 billion), the U.S.A. (318 million), Indonesia (233 million), Brazil (195 million), Pakistan (185 million), Bangladesh (164 million), Nigeria (158 million), and Russia (140 million). Among the 47 prefectures in Japan, the population of Tokyo was the largest with 13.162 million, followed by Kanagawa-ken (9.050 million), Osaka-fu (8.863 million), Aichi-ken (7.408 million), Saitama-ken (7.195 million), Chiba-ken (6.217 million), Hyogo-ken (5.589 million), Hokkaido (5.507 million), Fukuoka-ken (5.073 million) and Shizuoka-ken (3.765 million). These 10 prefectures each have a population of over 3 million. Tokyo also ranked at the top in the population increase rate with 4.7%, followed by Kanagawa-ken (2.9%), Chiba-ken (2.7%), etc. 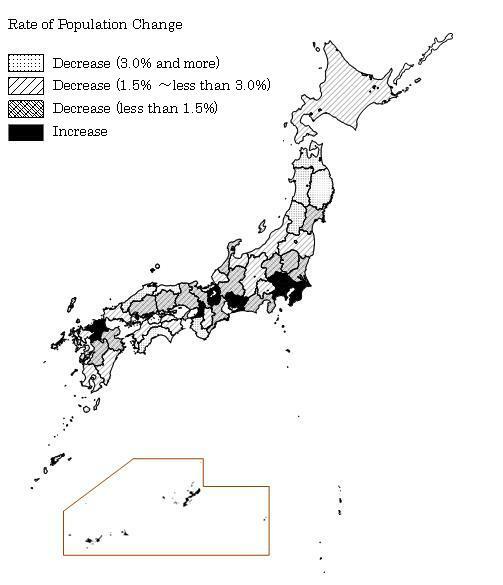 9 prefectures experienced population increase from 2005 to 2010, which was a decrease from 15 prefectures from 2000 to 2005. On the other hand, Akita-ken showed the highest population decrease rate of 5.2%, followed by Aomori-ken (4.4%), Kochi-ken (4.0%), etc. 38 prefectures lost the population from 2005 to 2010. For the information about prefecture name, please check the following URL. For further details, see the website below.